Speaking of the Wingfield Towers, I have a mission for all you Renoites out there. The news articles have mentioned how the Wingfield Towers is being built on the site of the Wingfield Mansion, an old house that was built for George Wingfield in 1907. The mansion was lost in an arson fire in October, 2001, and the site has been vacant ever since. What I’m wondering is: does anyone know more about this Wingfield Mansion? I used to haunt the WeFi/Wingfield area back in the late 90s, back when my friends and I had distant dreams of moving into the Park Towers. Or maybe those apartments above Java Jungle – you know the ones, where you can sit on the balcony and watch the kayakers, or the concerts in the park below? We were so jealous of the people who lived there. Anyway, we walked Island Avenue and the Riverwalk more times than I can count, but we must have always been looking out to the river, since I have no memory of an old mansion in that area. In the upper left is Park Tower. On the far right is a church, and in the lower left, on the corner of Arlington and Court, is some house. But what’s that in the lower right of the block? It looks like the burnt-out and/or delapidated remains of a big house. Could that be the Wingfield Mansion? Did this satellite photo capture it in its burnt state before its remains were demolished? Is this before the fire, and the roof was just in really bad shape? Or am I totally off base? Mabe someone out there actually has a memory of Reno that goes back five years ago, and can help me fill in the gaps here. And if anyone has a photo of the Wingfield Mansion, that would really be gold. Let me know right away! Post a comment or e-mail me at scotts at computer-vet.com. As a bonus for indulging me this long, I’ll leave you with this picture. It’s from an RGJ article I found when I was searching for info on the Wingfield Mansion. 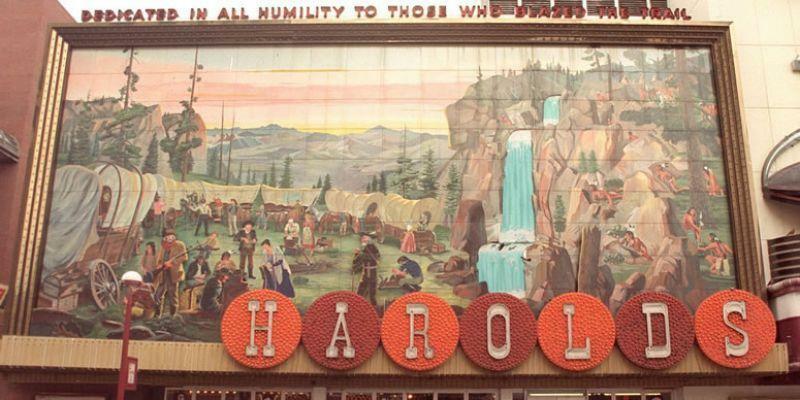 The article is about the mural that used to sit on the outside of Harold’s Club in downtown Reno. Harold’s Club was demolished in 1999 or so, and used to sit on the corner of Virginia Street and Commercial Row right next to the Reno Arch. Where Harrah’s entry plaza is now. Anyway, this mural was built in the 50s and used to be as much a landmark as the arch itself, but when Harold’s was torn down they boxed it up and put it in storage. They’re trying to find a space to display it in, but for one thing it will cost tens of thousands of dollars to install, and for another the political correctness worrywarts are worrying that its depiction of Indians waiting to ambush a wagon train isn’t exactly true to the way things were in Nevada. So they’re not sure if it should even be displayed. At least they weren’t three years ago, when the article was written. I think that Park Towers is actually in the upper left of that photo. 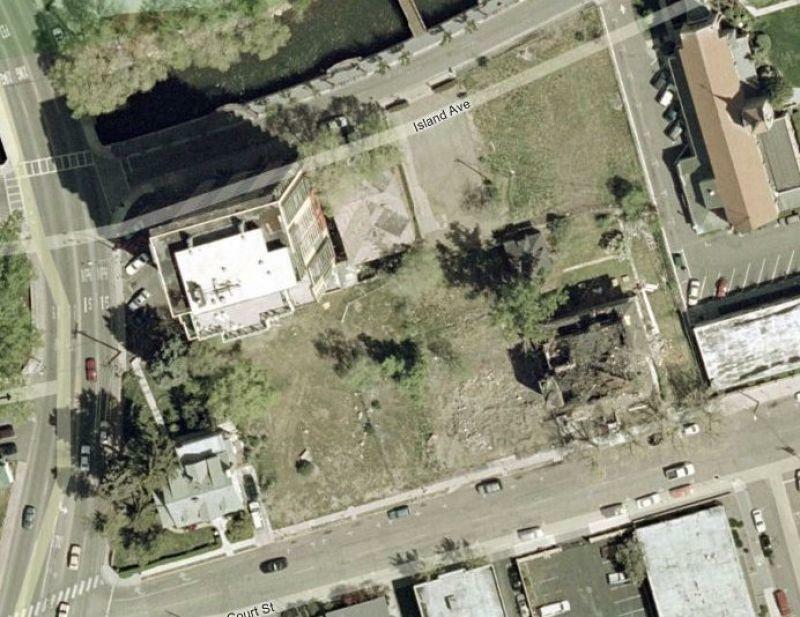 I think the mansion used to be in the bottom right corner of the lot where the remains appear to be. They mostly cleared it up a couple of years ago, but I moved into PT after it burned down so I dont know for sure. Oops! Nothing editing can’t fix. I meant to say upper left, I really did! The mansion faced Court St. It springs immediately to mind when I think of the introductory chapters of The City of Trembling Leaves. It is as if Clark was envisioning this house when he wrote of the majesty of the trees and the architecture of the Court Street Quarter. The Harold’s Mural is not in storage. It has been on display on the southern side of the Livestock Events Center (facing the Washoe County complex) for approx. 2 years now. Well see, that’s how out of it I am.